The all-new, expanded follow-up to southwestern British Columbia's best-selling hiking guidebook--now featuring trails on the islands and northern Washington. For nearly fifty years, David and Mary Macaree's iconic 103 Hikes in Southwestern British Columbia has been the province's most popular and most trusted hiking guide, with more than 100,000 copies sold to date. 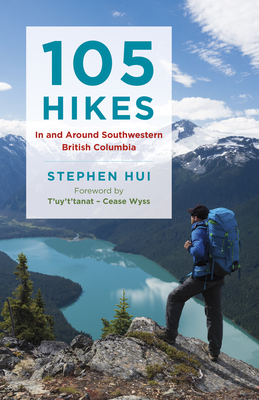 Author Stephen Hui carries on the Macarees' legacy in 105 Hikes in and around Southwestern British Columbia--an all-new, expanded follow-up inspired by their beloved classic. With an additional selection of trails on the Gulf Islands and in Washington's North Cascades, options for hiking with children, and rainy day recommendations, 105 Hikes covers a wider area and wider range of abilities than its predecessor. Like the Macarees, Hui provides detailed information about how to get to each trailhead (including transit options, where available), distance and elevation gains, estimated hiking times, and points of natural or historical interest. But he also includes all-new features such as an at-a-glance summary of all the hikes in the book; tips for hiking safely and ethically; clear, topographical color maps; a rating system for hike quality and difficulty; Indigenous place names where appropriate; and shorter or longer options for every outing. Stephen Hui has been hiking, backpacking, and scrambling in British Columbia's Coast Mountains for twenty-five years. His outdoor writing and photography have appeared in the Georgia Straight, the Toronto Sun, Vancouver Is Awesome, and Wild Coast magazine. Born and based in Vancouver, BC, Hui works for an environmental organization and serves as a director of the Wanderung Outdoor Recreation Society. T'uy't'tanat--Cease Wyss is an ethnobotanist and recently has returned to a textile arts practice through learning Coast Salish weaving techniques in wool and cedar. She is a member of the Aboriginal Writers Collective West Coast and lives in Vancouver, BC.